Outcasts is the third installation of GTO, however unfortunately, it seems a bit tame compared to the first disc that was released. The great teacher Onizuka, a 22 year old teacher with very little experience, gets up to his old tricks again, though he only seems interested in helping out the buxom girls on campus. In the interim however, he has made some good friends. 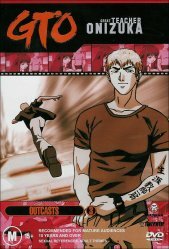 Being under so much scrutiny for his unorthodox teaching methods and of course his lack of knowledge, Onizuka helps out a young but unpopular girl who only seems to get picked on all the time. Her only assets being her hoo hoo�s (breasts), Onizuka is compelled to help making her popular, more popular than the school bullies in fact. With a total of five episodes on GTO�s third installment, it is both value for money and also a rip off. Obviously you are getting more than the usual four episodes to watch, but the series seems to go in groups of two episodes for each small story. As you can guess you�re happily watching the DVD when at the end of the 14th lesson it leaves you hanging for the next part of the story. Especially, add to the fact that the story ends with a cliffhanger doesn't help this reviewer! After watching this particular series of GTO I�ve realized that it�s actually quite corny, not so much the story lines themselves but the context of the conversations. To clarify, it seems at times that there is interaction for the sake of interaction, not story progression. A person can say hello to another and be answered with peels of laughter, it doesn't make sense and does tend to irritate. The DVD has moving menus but they don�t move around when you select something so I�m not sure whether or not this is classed as an animated menu or not. The disc slick rates it as a motion menu which is a more accurate description. Of course the DVD has its usual Madman propaganda and I�m looking forward to two of the previews on there, they look fantastic. Extras also include the original character sketches and the opening and closing movies without the text; a good feature if you love GTO. With a fully working DVD setup, you can really appreciate the sound and picture quality of the GTO series, this installment proving that point. Clear sound all the way through, not hissing or low level noise and the picture quality is out of this world. You can�t miss out on this DVD, if you haven�t seen any of the other GTO series than this is good one to get you interested in the series, usually the first in a series isn�t really exciting but the third is great with a good story line, picture and sound quality the third GTO is a must.